It’s been a long time coming, but oh boy… when it happens, it happens. We have gone over the top. Preserve the Pensions, remember, is the effort to digitize millions of pages of fragile documents in grave danger of deterioration: records of War of 1812 pension records held by the National Archives. The records documenting more than 180,000 pension records for War of 1812 soldiers and their families are among the most heavily requested documents at the National Archives and, because of their use, their age and their fragile nature, they really need to be digitized to protect them forever. The effort to get these wonderful records digitized has been led by the Federation of Genealogical Societies, with matching funds support from Ancestry. Every image digitized becomes available, free, to the public. This campaign needed to raise millions to finish the job, and raising millions is a huge job. Today, Witcher and Rencher announced that an anonymous donor — not a genealogist — had contributed $500,000 to the campaign to protect and preserve these records. That amount was then matched by Ancestry, and became $1 million. And with the funds contributed to date by readers like you and member societies of FGS and so many genealogists — the entire amount needed for this project has been raised. I only wish that Michael J. Hall of FamilySearch could have been here in Springfield today to receive his award from FGS for his efforts to raise funds for this project. And — sigh — I suppose I should mention that — because of your support, dear readers — the FGS Directors Award for 2016 was presented to none other than The Legal Genealogist. But it’s really not thanks to me at all. It’s thanks to you. Thanks to people who stepped up and pitched in. Thanks to everyone who tossed so much as a single dollar into the hat. This was one of your feel good blogs and it made me feel good. When everyone pitches in, the impossible can be achieved. Way to go, Judy! Getting the word out is often half the battle…and you certainly do get the word out. Thank you! That is simply awesome! Congratulations to all involved and especially to you, Judy, on your well deserved award. 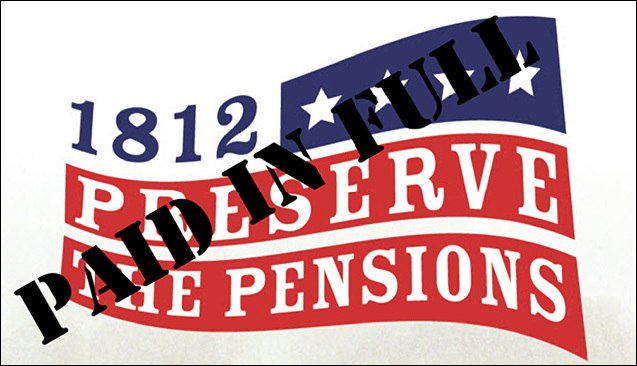 What else is there to say but WAHOOOOOOO!The pensions are preserved! Super! I am fortunate to be so old that I ordered mine when GSA still had control but happy for genealogy.